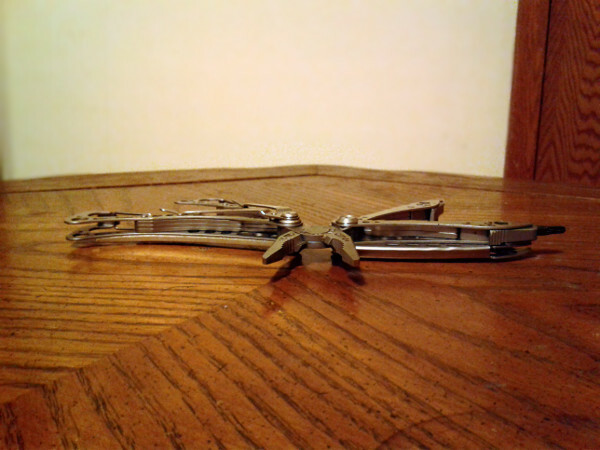 An instance of SCP-3406-1 that originated as a stainless steel Leatherman-brand pocket tool. Special Containment Procedures: Documentation detailing the requirements and procedure for SCP-3406 is available to personnel with 3406/3 Clearance. Supplies suitable for its performance are available at Site-27; Testing Chamber 48-A is available for testing of SCP-3406. Under no circumstances should SCP-3406 be performed on hostile or potentially dangerous subjects. Instances of SCP-3406-1 should be stored in Non-Humanoid Sapient Containment Cells of an appropriate type. Description: SCP-3406 is a ritual that causes sapient entities with a physical form to become capable of locomotion. Entities that already possess this ability, such as humans, will remain unaffected — anomalous effects are most pronounced in entities with inanimate bodies, or ones that are "bound" to inanimate objects. Entities affected by SCP-3406 are designated SCP-3406-1. SCP-3406's method of operation is not fully understood, but adherence to its guidelines reliably produces the stated effect. The ritual is performed by surrounding a healthy, conscious human being with seven identical metal sculptures and having the subject recite a specific series of phrases from the as-of-yet untranslated █████████ language while a current of at least 3 Amperes runs through their body.1 Following this, within six minutes, anomalous changes can be observed in objects within the same room as SCP-3406. The exact changes that occur to affected entities vary drastically between SCP-3406-1; often, SCP-3406-1 will develop a set of 2-6 flexible limbs that can be used for locomotion, or become able to use pre-existing limb-like extensions. In the case of objects that possess other means of movement (i.e. vehicles), SCP-3406-1 will typically gain the ability to operate these means. Instances contained within media of some sort, i.e. those tied to particular images or sounds, will rarely develop gross physical alterations, instead gaining some ability to manipulate their representation within the media in question. A means of communication will often develop, though the exact nature varies between cases — comprehensible speech is typically only produced in cases where the entity's mind is humaniform. History: SCP-3406 was developed by members of the Serpent's Hand in the late 1990s, following an incident in which several members had their consciousnesses displaced into various objects (see Incident Report 1993-SH-6T, "Trial of the Lake of the Woods") by an opposing faction of the same organization. Six SH operatives with knowledge of █████████ thaumaturgic traditions and neuroessokinesis2 devised SCP-3406 in an attempt to restore their co-conspirators to their previous bodies. While this attempt was unsuccessful, SCP-3406's function was found to be useful for other purposes and saw sporadic use throughout the Serpent's Hand and affiliated organizations in the following years. Addendum: Knowledge of SCP-3406 came to the Foundation in 2006 when documents detailing SCP-3406 were retrieved from the house of an independent researcher (PoI-3406-7) formerly affiliated with the Serpent's Hand who was investigating SCP-3406; a community of SCP-3406-1 measuring in the hundreds was also located in the building. Relevant excerpts from the recovered documents are reproduced below. Reminder to self: investigate golems. Reality follows from the symbol, and the mind is a machine for making symbols. The █████████ incantations are a very comprehensive and powerful symbol for Life. The electricity and the scepters push this symbol outwards into spaces that are prepared to receive it. Technical details follow. The carrier wave is complex, the imaginary component is much larger than the real electromagnetic component, and it's no wonder my models have been useless. This probably explains why it doesn't make humans doubly alive or anything like that — it works best on schemata perpendicular to our own. I will test this to make sure. NOTE: I've inferred this from the things my test subjects say. When I tell them this, they seem to think it's plausible, if flowery. Seems nigh-impossible to disprove, though, which…? The spell doesn't penetrate solid or dense objects, since the energy field it makes is, in the "traditional" sense, very weak. Not sure how to model it — it normally decays quickly enough, but each new target can transmit the field itself, and at a greater distance each time. I don't think there's much risk for a chain reaction when performed carefully, but this should be performed exclusively indoors, just in case. The following is, chronologically, the most recently created document that was recovered. I'll conduct some more interviews with my test subjects and get back to this. PoI-3406-7 could not be located after the seizure of the property. The SCP-3406-1 instances denied any awareness of the aforementioned interviews. On 19 December 2018, the above document was leaked to several neutral and hostile Groups of Interest by an unknown party within the Foundation. Documents detailing the requirements and procedure for SCP-3406 were also leaked. It is likely that SCP-3406 will be used to disrupt normalcy and/or Foundation activities, and could potentially result in an MA-Class Mass Animation Scenario if used extensively. SCP-3406 is considered uncontained. 1. While this would normally be lethal, subjects experience no ill effects beyond short-lived fatigue and apathy. 2. Alteration of reality via neural patterns, biological or otherwise.